This post is coming at you on such a whim. I really wasn’t planning on posting this today. It was just an idea that’s been floating around my head for the last couple of days that I finally decided to just make already! To my surprise and delight it came out perfectly! 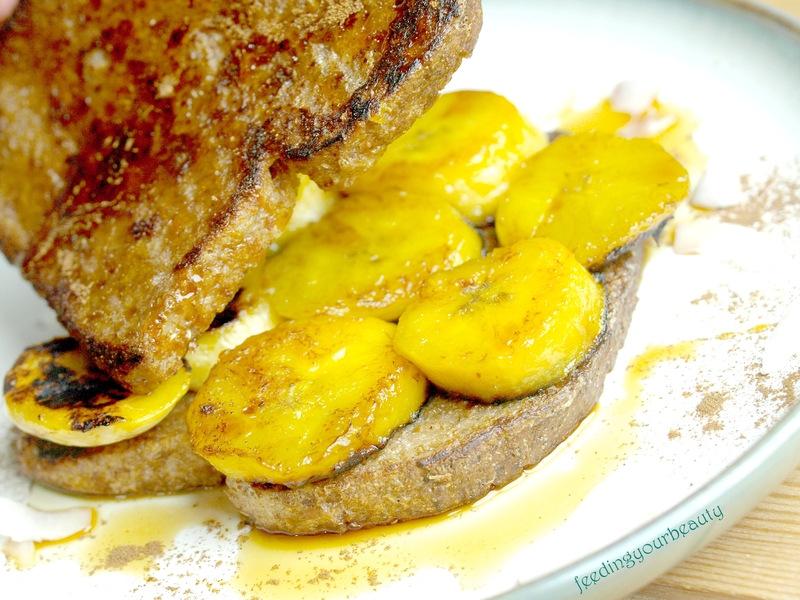 This french toast is inspired by a dessert that I’ve never tried, in a Caribbean restaurant in our town that I’ve never been to. Why we haven’t been there yet, I have no idea. I’d say about once a year I’m reminded of it and I go and oogle the menu all over again. The menu has a small but delicious vegan section, and I want to try each and every dish. I’m basically in love with the whole concept, the flavors, the mom and pop atmosphere, the fried plantain sandwich (mmm, yesss!). But most intriguing is a dessert of sweet fried plantains with a coconut milk, nutmeg, and cinnamon sauce. My mouth waters whenever I read it. Although I haven’t actually tasted it, I imagine it is as incredible as it sounds. I translated that yummy dessert into a stuffed french toast, and it is probably one of the best ideas I’ve had in a long time. 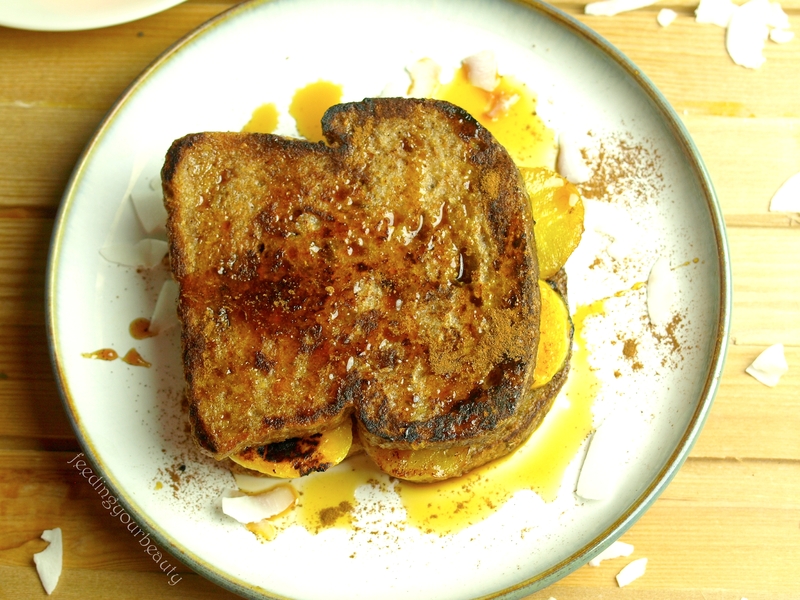 Fresh coconut milk, warm spices, and sweet carmelized plantains combine for a breakfast or brunch that is going to have you dreaming of the Caribbean. Make the easy coconut milk. Boil some water in a kettle. Add the shredded coconut to your blender. Add 1/2 cup hot water from the kettle. Allow to sit for a few minutes while you gather your other ingredients. Then add another 1/2 cup of water, cold or room temp to the blender. Blend on high for a minute. Strain the milk through a fine mesh strainer. Rinse blender and add the milk back in. To the milk in the blender add 3 – 4 tablespoons of arrowroot powder (I did 4 tbs), 1 soft medjool date, spices. Blend until smooth. Pour into a shallow dish and allow to sit while you toast the bread and preheat your skillet. Add a tsp of coconut oil to your preheated skillet. Give the coconut milk mixture a quick whisk and then dip both sides of the toasted bread into briefly, not soaking just coating it. Cook in the skillet, lightly browning one side and flipping to brown the other side. Fry your plantain slices in a teaspoon or two of coconut oil in a small frying pan over medium heat. Turn the heat down if they start getting done too fast. They should be soft and have slightly charred/carmelized edges. 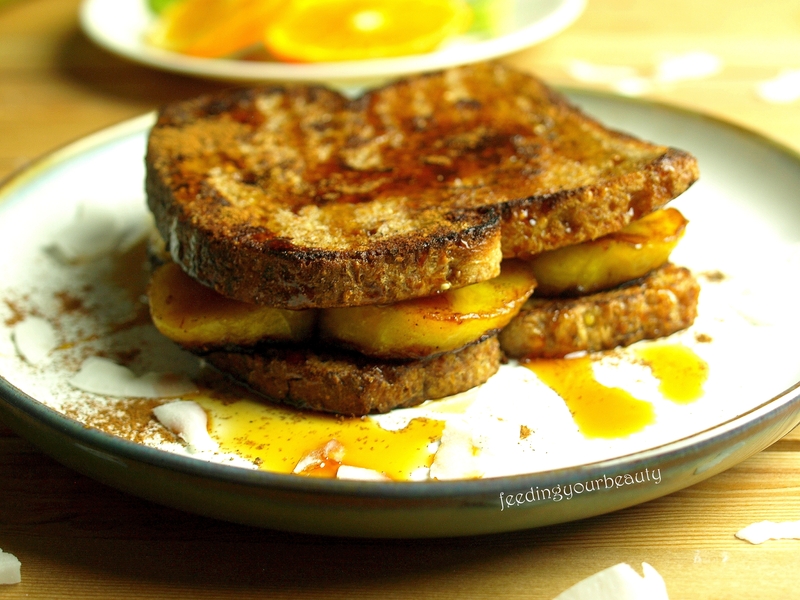 Sandwich the slices between the french toast and drizzle with coconut nectar or syrup of choice (date syrup, maple syrup). Sprinkle with cinnamon. I’m sure you could use a “lite” canned coconut milk or even a coconut milk beverage like So Delicious in place of the homemade, but the homemade is so easy and cheap, and tastes more coconutty. I would probably warm up the store-bought milk a bit if you go that route so the arrowroot dissolves in it easier. In the past I’ve also used about a Tbsp of ground chia seeds, or even tapioca starch to thicken the milk and flaxseeds work too. 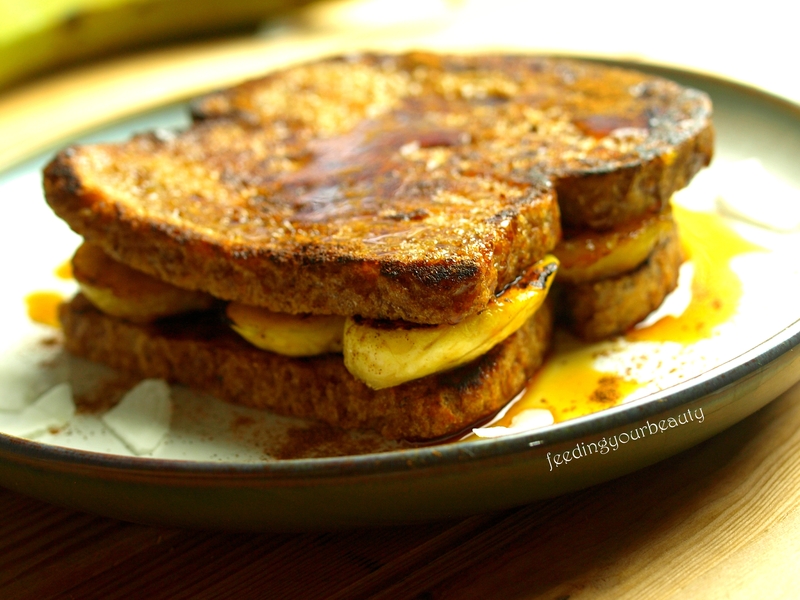 You can absolutely use fried bananas instead of fried plantains. If you use a bread like sourdough or another sturdy bread, you probably don’t have to toast it first. I really, really don’t like soggy bread, so that is why I toast mine first! I use Food for Life Ezekiel Bread, which is a sprouted whole grain bread and the only kind we buy. Gluten free should work great too. Oh wow this would make a great naughty breakfast treat. Thanks for sharing. O.m.g! This looks absolutely delectable!